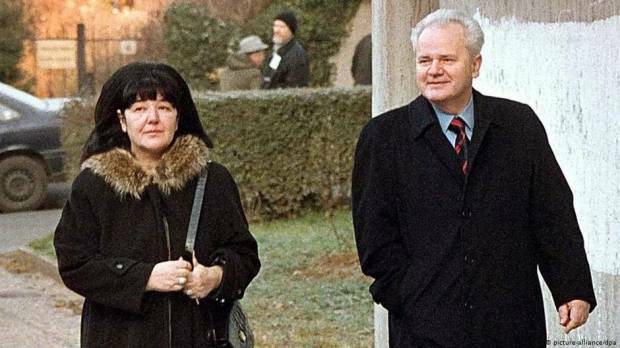 Mirjana Mira Markovic, the widow of Serbian ex-leader Slobodan Milosevic, died in Moscow on Saturday at the age of 76. Her death once again united the couple that once wielded ultimate power in the Balkan country. Mirjana was born in 1942 to a mother who was a Communist resistance fighter during the German occupation. Her mother was arrested by the Gestapo the following year, she was tortured and shot. After her death, it was rumored that it was in fact the partisans themselves who had shot her for treason. Her aunt Davorjanka Paunovic was a mistress of Yugoslav dictator Josip Broz Tito throughout the war, until she died of tuberculosis in 1946. Mirjana’s father, Momcilo Moma Markovic, was one of the key Communist Party figures in Serbia. After the end of the war, he was decorated as a hero and became one of the new government’s top officials. Mirjana grew up with her maternal grandparents, mostly seeing her father only during school breaks. People who lived in Yugoslavia during the 1980s and the 1990s can recall that Mirjana Markovic always wore a flower in her hair while in public. She claimed it was because the only surviving photo of her mother also shows her with a flower in her hair. She attended high school in Pozarevac, the birthplace of Slobodan Milosevic. The future nationalist leader was one year ahead of her. They started dating after meeting in a Communist youth organization. This was the beginning of the story about an inseparable couple who steered Serbia towards economic crisis, wars and a conflict against the western world.